We don’t normally review books about club cricket on CricketWeb. There is in part a pragmatic reasons for this, in that this reviewer doesn’t own very many, and never seems to get a chance to read the few he has acquired over the years. More generally it is also the case that, with the best will in the world, the interest in any given title is almost always going to be limited to the general area where its subject is located. There have to be exceptions to general rules however, and despite the fact that I have never played at or visited any of the clubs that comprise the Strathmore Cricket Union I am happy to treat their ninetieth anniversary history as such an exception. I do this for a number of reasons, but certainly the first is because I know one of the authors, Richard Miller. Richard is well aware of my weakness for a limited edition, so as well as publishing a paperback version of the book he has also printed thirty hardbacks which each contain a numbered limitation page signed by himself and his two co-authors. More importantly the book is also an enjoyable and thought provoking read. One question that the title of the book begs is why now? Most club histories mark a centenary, and whilst there have been plenty covering a variety of anniversaries I do not recall seeing a publication celebrating ninety years before. To be fair to Richard it is a question he does not shy away from. Part of the explanation is the unconvincing one that, in his words, in ten years time, the authors could all be dead or gaga. I take the first part of this with a pinch of salt, because whilst he is somewhat coy about his own age I do not believe Richard is dangerously venerable. On the other hand knowing what I do of his cricketing and other interests I can see that the second possibility identified might be a real concern. On a more serious and worrying note another explanation is offered. I will quote Richard at length on this one because the point he makes is certainly not restricted to Scotland; having recently sat through the Union’s Annual General Meeting I am more convinced than ever that the Union as presently constituted will be gone within the next ten years. Like so many sports in Scotland teams are increasingly comprised of old men and wee boys. Most of the boys stop playing once they hit seventeen or so and the old men will eventually have to give up, so sport in Scotland is dying, even football. I have argued for years that ploughing vast resources into youth development and none into senior retention is a flawed strategy. Yes, the very best probably stay on and enjoy a lengthy career, but the rest just vanish. Cricket Scotland is focussed on achieving Test status by 2023 which will be great, but there won’t be very many people playing at the bottom end of the game by then. No one will be more pleased than Richard if he turns out to be wrong, and hopefully if heed is taken of his warning he will be. But I digress. What is the book about? I will let Richard explain; the Union currently provides league cricket for clubs from Stirling to Aberdeen, but traditionally its main focus was from Perth to Aberdeen. At this point I will interrupt Richard as this raises my only real criticism of the book. I have not put this to him, as I am sure his response would be to the effect that those for whom he wrote the book will not need it, but as a Sassenach I would have appreciated a map of Scotland showing where the clubs are or were located (over the years there have been sixty of them). On the other important question, that being as to the standard of cricket played, I will simply make the observations that the leading clubs employ professionals, and then let Richard go on to explain that; several Test cricketers have begun their professional careers in the competition, most notably Justin Langer and Azhar Ali and a few others have played from time to time, including Desmond Haynes and Derek Randall (albeit for only one match each). 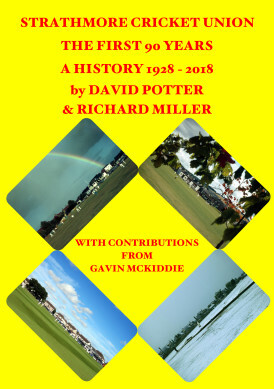 As far as the format of the book is concerned it begins with a nod towards the possibility of a wider audience with a brief history of Scottish cricket before then moving on to take a chronological trip through those ninety years. There are plenty of photographs, both colour and black and white and all are very well reproduced. There then follows a brief entry in respect of each of those sixty clubs followed by the obligatory statistical section, something else which is worthy of considerable praise. The tables are very well set out, and an excellent job has been made of choosing what to include. Inevitably some tables are more illuminating than others and in this case the most interesting is the record runs tally for a season. With 1,410 Azhar Ali is top of that list, 187 ahead of the man with the second best aggregate. Langer is thirteenth with 1,010. Another Australian Test player who plied his trade in the Union, Andrew Hilditch, does not make the top 34 – presumably this means that Scottish bowlers worked him out in the same way that England’s did. An interesting chapter, sandwiched between the club directory and the stats, is one regarding the Union’s finances. In three stints Richard has spent the best part of twenty years in the role of treasurer, a job which clearly changed a great deal over that time. And what of the quality of the writing? Amateur writers can make a mess of the most interesting material, but that certainly doesn’t apply here. The narrative largely comes from Messrs Potter and Miller, who share a similar style, although I think I can generally work out who has done what. Both have an engaging and conversational way of writing. Richard also has a sense of fun and there are a number of humorous asides in the book, almost all of them at the expense of the English, something which came as no surprise to me. In short that missing map apart I cannot find fault with Strathmore Cricket Union – The First Ninety Years, and if this review has interested any neutrals then I can advise that a copy of the limited edition might be available from Boundary Books in England, or Roger Page in Australia, if they have not sold out. The paperback can be obtained from Richard himself for £10 plus postage, and we will happily pass any enquiries we receive on to him. It is also worth noting that in the event a purchaser were to be disappointed with the book there is a saving grace because, given the quality of the paper on which the 282 pages are printed, as Richard himself points out; if you don’t enjoy the content the book will make a pretty useful doorstop. This week one of the best writers on the game appears for the first time on CW - and yes the accompanying image is of the somewhat unusual dust jacket of the first edition.